Today it looks to be dead. 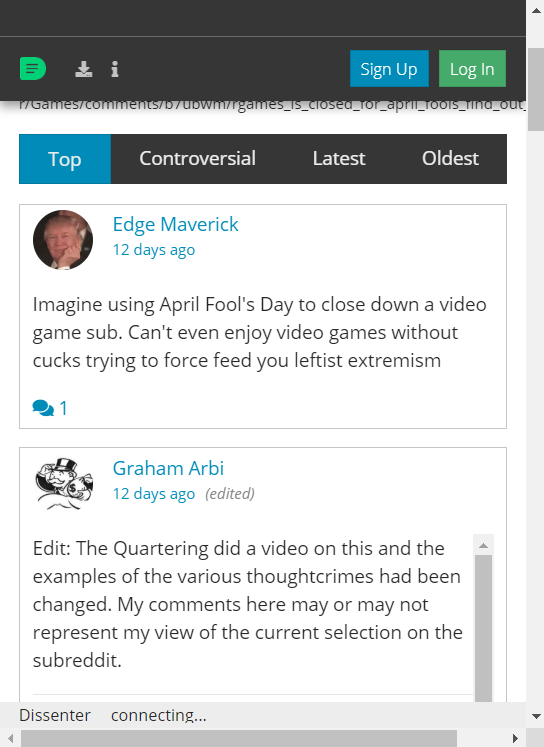 Gab’s Dissenter was a short-lived experiment, but it has definitely raised some questions around moderation of comment sections, browser extensions, and web discussion in general. As the author of a similar extension, I’ve been keeping track of it and thought I’d share my thoughts. For those not familiar with Gab or Dissenter: Gab is a social network that has a reputation as a safe space for the alt-right. Marketed as a free speech platform, in practice it attracts primarily far-right wing users. 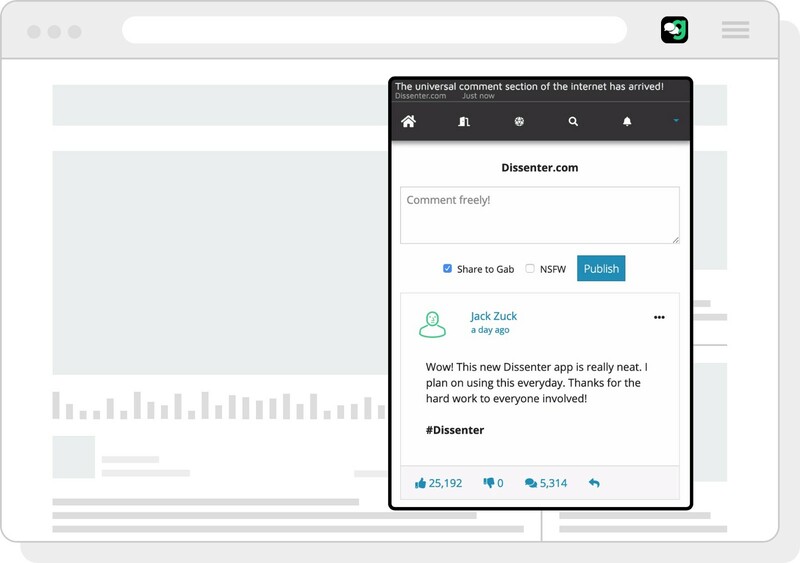 Dissenter is/was a browser extension that overlayed the webpage, providing a comment section on a per URL basis. This meant that users could comment anywhere, regardless of availability of comment sections on the website, and independent of the site owner. The execution of the extension (in my opinion) was quite poor. I’ve been in this space for a while and I’ve seen a lot of competitors; in terms of implementation, Dissenter was one of the worse of the bunch. The entire comment section was inside a native extension popup, and as far as I could tell didn’t allow for threaded reply functionality. Despite the technical shortcomings, it garnered a lot of attention and over 80,000 users. Aand that’s enough of that, it’s like this everywhere. Of the comments I’ve seen, there are only a handful I’ve come across that don’t include an insult of some sort. These examples aren’t necessarily hate speech, but it’s certainly not constructive discussion (and these are some of the tamer comments). I’ve been monitoring threads on Reddit over the past couple of months using a bot that notifies me when people talk about Dissenter. While there were certainly moderates interested in the tech more than politics, the vast majority of posts regarding Dissenter were on typical right wing subreddits (The_Donald, KotakuInAction, Right_Wing_Politics, etc.) spruiking the extension as a way to bypass moderation on non-right-wing webpages and insult the subjects/content. There was at least one thread (which I won’t link here) that used Dissenter to distribute 3D print models of untraceable Glock components via Twitter. So why was Dissenter so full of toxicity? Well, its userbase was a double-edged sword. 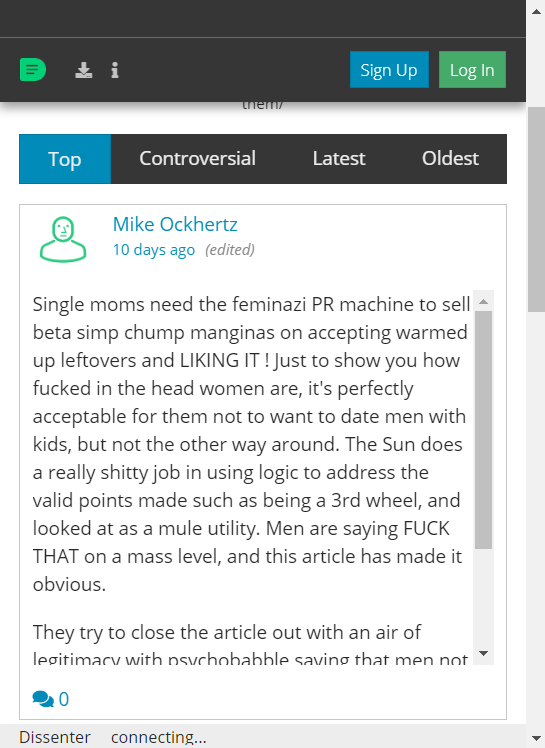 The target audience of Gab are very vocal, and very willing to share their “criticism”. This meant that Dissenter got a lot of traction in a short amount of time, and a decent amount of user interaction. Users loved the fact that they could post whatever they wanted, wherever they wanted. However, combined with a common political ideology, it resulted in poor user-user interaction and became less of a discussion and more of a spray of vitriol aimed at the subject of the webpage. This further alienated the mainstream when introduced to the extension, reinforcing the toxicity of the userbase. The idea behind Dissenter is nothing new, the concept has been around for a long time and attempted by several major players. Google Sidewiki (2009, discontinued), Hypothes.is (2011), Epiverse (2015), and Genius Web Annotator (2016, discontinued) are/were all platforms providing a similar service. The idea itself dates back prior to the existence of web browsers. Marc Andreesen originally had a vision for web annotation being central to web browsers, but the feature was dropped before Netscape’s release. The concept is not exclusive to political ideology, it just so happened the latest attempt was by Gab. Likewise, the product needn’t be marketed as some sort of bastion of free speech. The promise of a ubiquitous comment system is value in itself. So why hasn’t it taken off? Good question. In my mind, the largest barrier is that the internet is a big place. Without significant pre-existing content, it becomes incredibly unlikely that any individual user will stumble across a comment made by another user. This further hinders incentive for users to post in the first place, exacerbating the problem; what’s the point of posting comments if no one is going to read them? You end up with a cool system that no one is interested in since so few people already use it. This is one area that, in a way, Dissenter thrived. Because their userbase was less interested in having a discussion, and more interested in plastering their opinion over the top of webpages, the lack of pre-existing content wasn’t a concern for them. A more conscientious userbase may not have been so forgiving. Even a VC backed company like Hypothes.is (an academic centric initiative with over 100,000 downloads) struggles to maintain enough content to be self-sustaining. Epiverse tackles the problem in a different way. 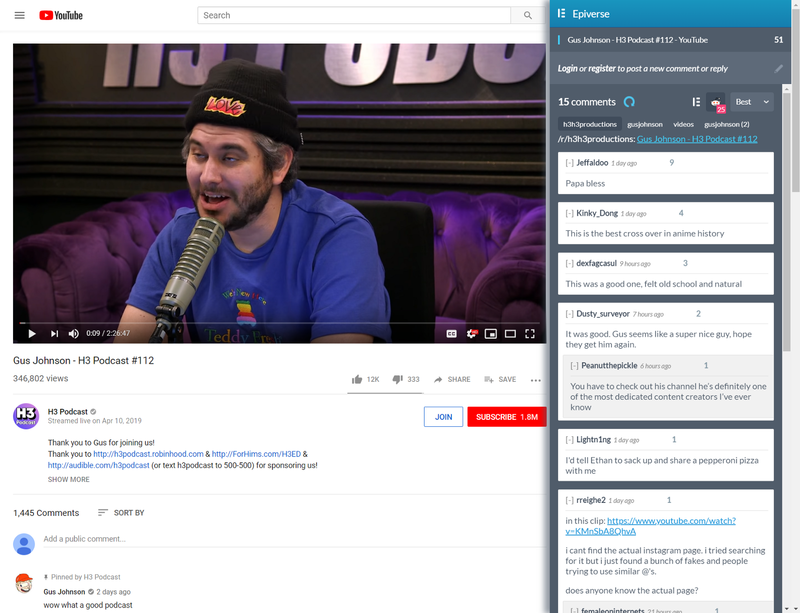 I’ve added the ability to display Reddit comments if there is a thread posted to Reddit in the context of URL visited. This means that Epiverse has pre-existing content for hundreds of millions of URLs already. If you visit a relatively popular YouTube video, there’s a good chance there’ll be comments on Epiverse via Reddit. It’s not necessarily a long-term feature, but I’m hoping it’s enough to attract enough mainstream users to build a self-sustaining userbase. There’s currently an ongoing debate over on the Firefox subreddit regarding Mozilla’s decision to pull Dissenter from its web store. A lot of Redditors (even those dismissive of Gab/Dissenter) are angry that Mozilla has removed it, citing it as an example of Mozilla hindering free speech. While some argue that private corporations are not responsible for infringements of free speech, there’s a counter-argument that “free speech” as a concept isn’t purely legal — it’s broader than that, and Mozilla, having previously declared itself dedicated to an open internet, is morally in the wrong. The topic has raised questions for me regarding Epiverse and content moderation. I’d love to be able to keep as a light a touch on moderation as possible, but if I found myself with a community like that of Gab’s I would absolutely be turning to content moderation. Does that go against my goal of transparent web discussion? I hope not; I consider transparency different to content moderation. Transparency to me means being able to post comments independent of websites’ influence and keeping those websites honest, but it doesn’t mean being able to post whatever you want, uncontested. Perhaps this introduces bias on my end, but I think it’s an important distinction. As I’ve been writing this, Gab have announced they’re going to launch a browser (a fork of Chromium) including Dissenter and ad-blocking by default. All the best to you Gab. In the meantime, they recommend users install the extension using the browser dev tools instead of the web store. So Dissenter still works, users just have to install it via source code. Also, I’d like to give a shout-out to Hypothes.is. Their platform is geared more towards annotation for research/academia rather than a comment system, but the concept and execution are similar. I think there’s enough room in the market for multiple platforms. Finally, if you’re interested in the concept of a ubiquitous comment system but not the Gab userbase, or you just want access to Reddit comments everywhere, feel free to come check out Epiverse. I’m not promising an unmoderated space — I’m looking to build communities fostering healthy discussion and will absolutely moderate where necessary (anything remotely close to hate speech will not be tolerated). But I can promise a technically solid platform based around a really interesting concept.